Home > Blog > Can We Restore 350 Million Hectares by 2030? With growing awareness of the economic costs of land degradation, political leaders are adopting ambitious targets to restore degraded forests and agricultural land. Building on the interest in forest landscape restoration generated by the Bonn Challenge, in 2014, countries adopted the New York Declaration on Forests to restore 350 million hectares (865 million acres) of degraded forests and agricultural land by 2030. That’s an area bigger than the size of India. Several regional initiatives focused on galvanizing further political and financial support for implementing restoration at scale have emerged, like Initiative 20x20 to restore 20 million hectares (49 million acres) by 2020 in Latin America and the Caribbean, and the African Forest Landscape Restoration initiative (AFR100) to restore 100 million hectares (254 million acres) of degraded forests in Africa by 2030. The question now is: How can we restore this massive amount of degraded and deforested landscapes? Evidence shows that we can—as long as we learn from the places showing early successes. Tree planting is key, but it's not enough. Following the groundswell of national commitments, the focus is shifting to the challenge of implementing restoration at scale. The world still deforests and degrades 15 million hectares (37 million acres) of land annually. To reach the target to restore 350 million hectares by 2030, annual restoration needs to be around 23 million hectares (57 million acres). Continuing with business-as-usual, which is largely focused on increasing the rate of tree planting, will not be sufficient to achieve this target. The main reasons are that planting is too slow, too costly and hampered by low survival rates in many cases. Many national tree-planting campaigns currently amount to only tens of thousands of hectares annually. Costs can exceed $1,500 per hectare ($607 per acre), so planting 23 million hectares every year would require some $34 billion annually. And that doesn’t factor in the fact that in many semi-arid restoration projects, fewer than half of planted trees survive. Can Restoration Scale at Low Cost? There will always be a role for tree planting, but the key to restoring hundreds of millions of hectares will likely also entail a series of steps that trigger and accelerate the widespread adoption of cost-effective and proven restoration practices such as “assisted natural regeneration.” Giving more attention to the protection and management of trees that regenerate on cropland as well as off-farm could make a big difference. The key is to enable rural communities to nurture and accelerate the growth of naturally established seedlings and resprouting trees. In Niger, farmers have built new agroforestry systems on 5 million hectares in 20 years, which is an average of 250,000 hectares (618,000 acres) per year. External funding costs were below $20 per hectare. 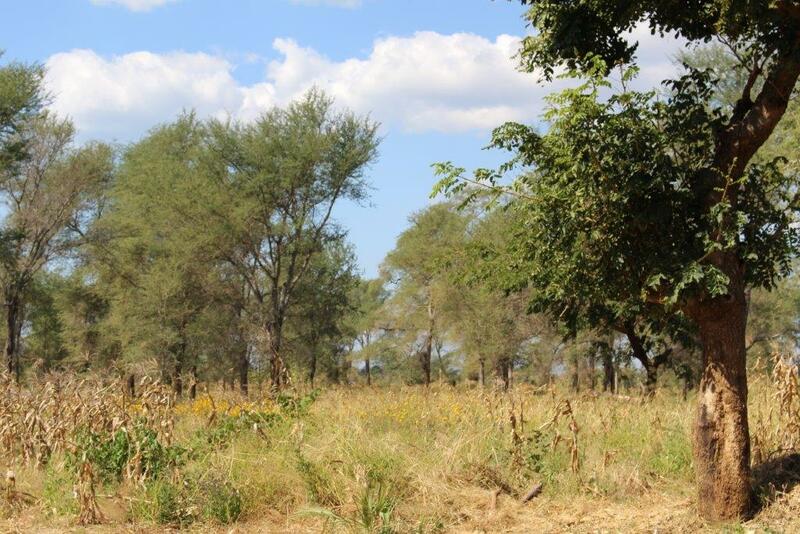 Farmers protected and managed the natural regeneration of woody species of trees and shrubs on their farmland, and by doing so they added 200 million new trees without costly external assistance for tree-planting. These on-farm trees help increase crop yields, produce fodder for livestock, improve household energy supply and increase household income. Northern Ethiopia is now greener than it has ever been during the last 145 years. Local communities organized themselves to control livestock grazing and wood cutting on degraded plateaus and mountain slopes, which allowed vegetation to regenerate naturally. Coupled with community labor investments in rainwater harvesting, alongside downstream development of irrigated agriculture, landscapes have been completely transformed by grassroots restoration. This has helped farmers and their communities diversify and increase crop production, secure water supplies and build resilience to drought. Costa Rica is another example of a country that has overcome a history of deforestation largely through assisted natural regeneration. Policy reforms that reduced subsidies to farmers engaged in converting forests to pastures for livestock production, along with the recognition of the economic benefits of forest restoration, helped to drive changes in land use. As forests have been restored, ecotourism has flourished and now provides significant economic benefits. These examples show that smallholder farmers are often the key private investors in tree-based restoration. Business as usual has often included increased support for forest departments to plant trees. While this is useful and important, greater success in achieving ambitious forest restoration targets may well depend on mobilizing a “restoration movement” of millions of smallholders in ways that both enable lower-cost restoration and encourages behavior changes that address root causes. Much more could be done to build on these successes. 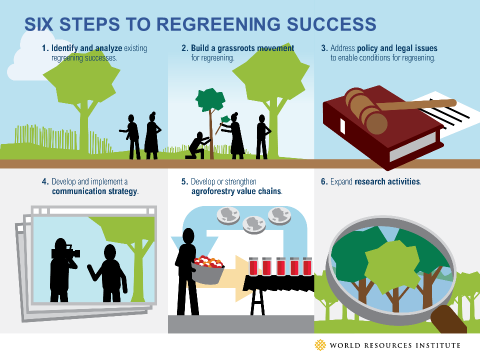 In 2015, WRI published a report about how to scale existing successes through six steps. Lots of stakeholders have a role to play here. There is a vital role for governments to improve forest legislation to strengthen tree tenure as farmers and communities will invest in trees if they feel they own them. NGOs and other organizations need to build a grassroots movement that supports peer-to-peer learning and the development of community-based institutions to protect and manage the new tree capital. And we need more investment from both public and private sources to expand communication and outreach activities, and to disseminate information about restoration successes and their associated benefits. In partnership with millions of smallholders, the global community can restore 350 million hectares – if we set our sights on what each key stakeholder needs to do and how to do it!